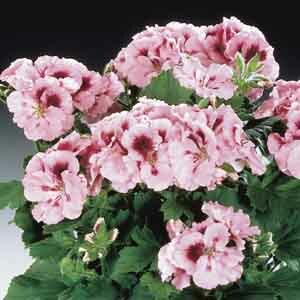 The same beautiful geranium that is a popular garden plant also makes a splendid houseplant. Regal geraniums have the colorful bloom clusters characteristic of other Pelargonium species, but their foliage has a distinctive grape-leaf shape. They bloom continuously if given a bright location. Place in a sunny windowsill or use as a table accent. Can be grown outdoors in warm weather. Potted plants make terrific centerpieces for the patio table or as part of a grouped container arrangement. Makes a stunning gift plant! Very easy to grow in virtually any location. Best in fertile, well-drained soil. Water as needed to keep soil evenly moist, especially in hot weather. Remove faded flowers for best display.